For all the fun and satisfaction that comes from entertaining, it’s very challenging for the cook. Most of us tend to get creative when we have folks coming to dinner. I attribute this to the need to impress, but also the desire to break from the normal routine. The recipe we clipped last year from our favorite food magazine or that trendy ingredient that we’ve needed an excuse to splurge on all seem justifiable with guests invited to dinner. After all, you’ve cleared some time to prepare dinner so why not go all out? I adore having a crowd around my table. Nothing makes me happier than multiple mouths to feed and I tend to go a little overboard. I also exhaust myself. After all, one can’t make their own bread from scratch, try out that new (but very time-consuming) recipe, and make several appetizers without a lot of effort and I’ve often found myself ready for bed when the doorbell rings announcing the first guest. This is a problem. Let me remind you that it doesn’t matter what is on your table, but rather who you have gathered around it. A few of the friends and family who come to your house will remember how good that tenderloin was, but all of them will remember laughing until their sides hurt or that one story that had everyone leaning in to catch every detail. So I’ve started to do things a little differently. I still use the opportunity of a few extra mouths to put on the ritz and try out some new recipes, but I also try to make a plan that leaves me energized and not exhausted when the doorbell rings. This involves choosing some recipes that can be done ahead of time. This beet tartare recipe is a perfect example. Carnivores and vegetarians alike will delight in this play on beef tartare that uses roasted beets tossed with fresh horseradish, dill, lemon juice, and capers. One may serve it as a first course, but it also works well as an appetizer on its own or served with toast points. It benefits from time in the refrigerator (so make it ahead of time) and packing it into a round cutter or mold for a perfectly-shaped portion adds professional finesse with little effort. Happy entertaining! The inspiration for this dish came from dinner at one of my favorite Charlotte restaurants: The Fig Tree. It was my birthday, which meant that I had carte blanche over our shared appetizers. My husband avoids beets at all costs, but one gets certain liberties on one’s birthday and all ended well as even he was scraping the plate with their version of this dish. Preheat the oven to 400°F. Place each beet on a square of foil and drizzle with a little olive oil. Season each beet with a generous pinch of salt. Wrap the beets in foil, enclosing them completely, and place them on a baking sheet. Bake until the beets are tender when pierced with a fork, about 1 hour. Cool slightly. Peel the beets and cut into a small dice. Note: When working with beets you should wear gloves to avoid staining your hands red. 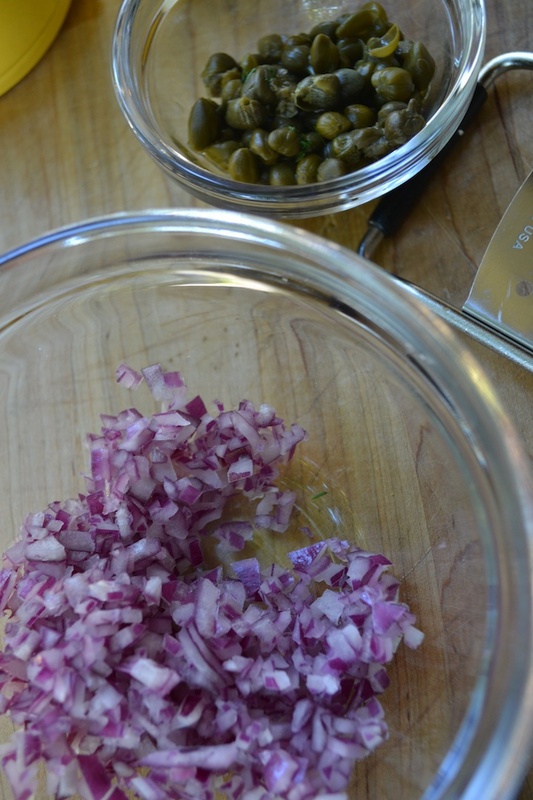 In a medium bowl, combine the diced bets with the remaining ingredients for the tartare. Stir to combine and adjust seasonings as needed. Refrigerate until ready to serve. 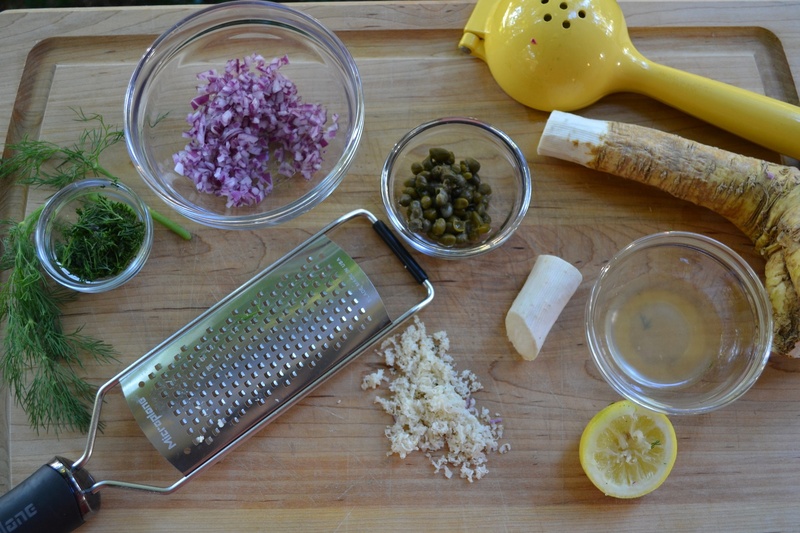 The tartare can be made up to one day ahead. 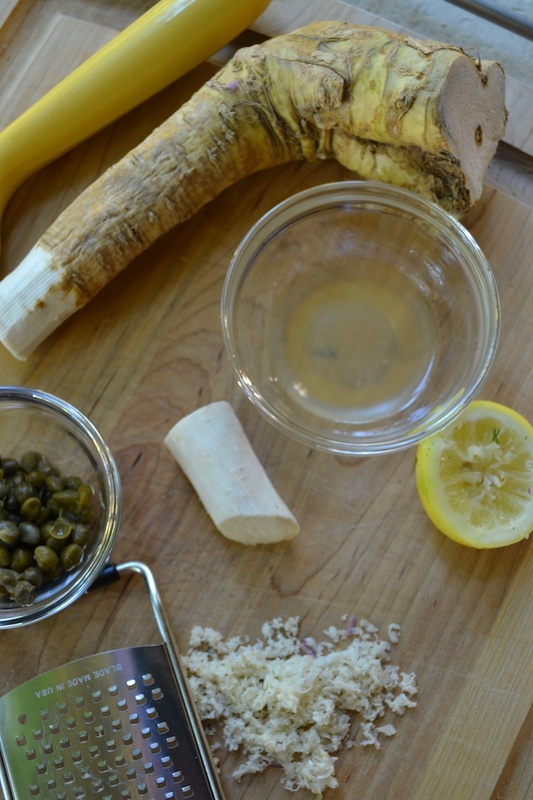 Before serving, taste the tartare and adjust seasonings if needed. You don’t perceive salt as much in cold foods so the tartare may require a little more salt at this time. For best presentation, place a round cutter or a round cylinder on a chilled, small plate and fill it with the beet tartare. Gently press down and then remove the mold to get a perfectly shaped mound of tartare. Repeat as necessary to get the desired amount of serving. Sprinkle minced dill over the tartare and serve immediately. If serving as an appetizer, the tartare could be shaped as described above or simply placed in a bowl and served with toast points. Enjoy! I also used to be exhausted by the time my guests arrived! And nervous too, I couldn’t even appreciate the meals, I was so afraid of messing up! But I agree, what is most important is for everybody (including the hosts) to have a nice time; nowadays, I make dishes I know very well, and also try to make as much as I can ahead of time! 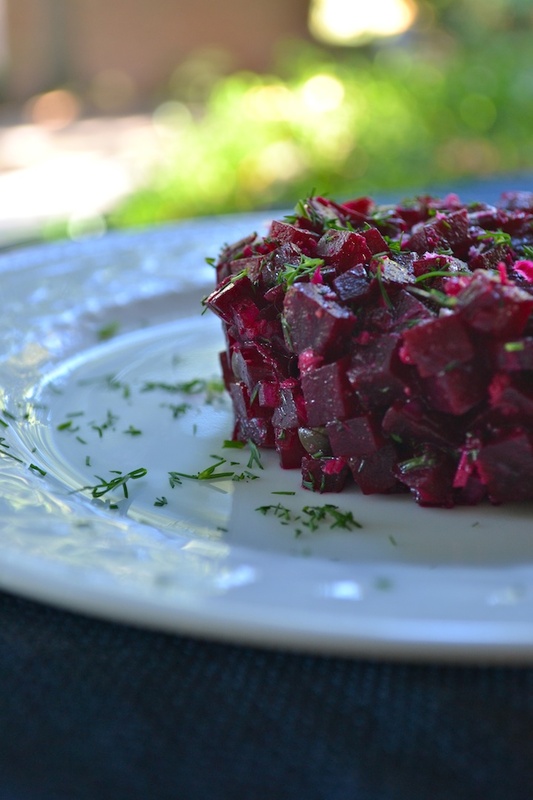 And I absolutely adore beet tartare (I posted a different recipe on my blog a while ago, but I was thinking horseradish would be perfect with it – it’s just impossible to find fresh horseradish where I live for some reason). In any case, now I want to try your version some day! It looks perfect! Thanks, Darya. I checked out your recipe and it looks delicious and just like beef tartare. The color is spot-on! I am going to try my version with yogurt one day. I’ll be sure to let you know how it goes! 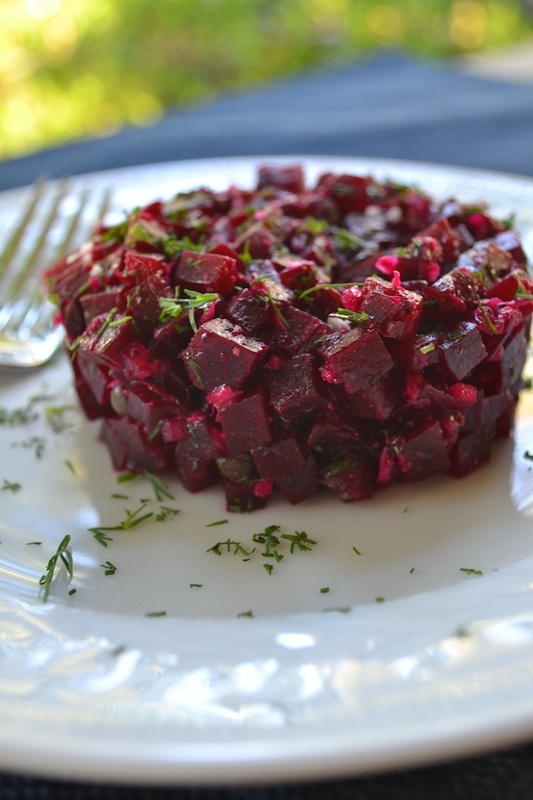 Not a favorite of any tartare… I do not like beets either…. but, I may be willing to try some with an invite to your table in November!